Book Your First Quarter Gains? The first quarter of 2019 has had a hot start. As of March 26, U.S. and global stocks are up more than 10%! But the positive streak is raising some concerning questions. I’ve personally heard strategists from prominent asset management firms advising folks to “book your gains” for 2019 now and call it good. Investors have also been wondering if they should take some risk off the table now, due to the year’s across-the-board stellar start. First, how are markets around the world performing in 2019? Below are some easily investable countries that CLS tracks. All but one is positive, and about half are above 10%! The U.S. is number eight on the list. In our opinion, you will have to look outside of the U.S. for higher gains going forward. Second, are investors better off trying to ‘time the market’ and reduce risk/go to cash? Generally, no. History suggests that timing the market is ineffective. Since 1970, there have been nine occasions when the S&P 500 Index returned more than 10% in the first quarter. All but one time (1987) the index finished the year higher than it was when the first quarter ended. Six out of nine times, the index finished above 20% for the year! See below. Finally, to the previous point – and this is an important one – is it uncommon to garner returns above 20% in a year? Nope. Let’s look at some base rates below from the CLS Reference Guide. 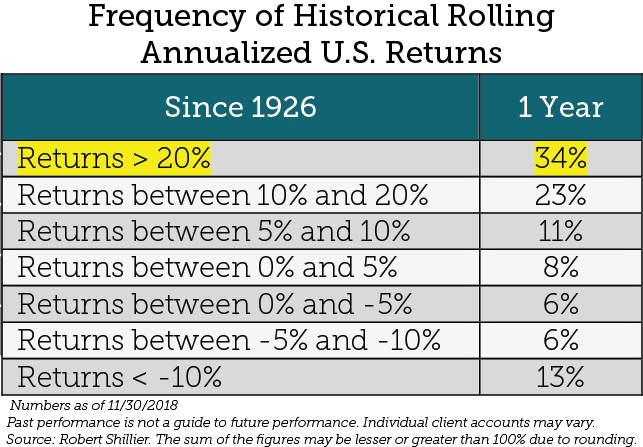 In any given, rolling year, the odds of a 20% or higher return is 34%. If you’re curious about how many calendar years produce more than 20% gains, it’s also fairly high: about 30%. I wrote about that here (in the final section). Stay invested, and don’t time the market. Easier said than done. A recent Vanguard paper regarding single-stock selection has spurred quite a bit of discussion. Below is a summary of the paper’s findings, along with CLS’s view and an outline of a better way to pick stocks. For the last 30 years, the median U.S. company common stock return is 7%. Not bad. For the same time period, the mean average U.S. company common stock return is 387%! Wait, what? How? U.S. stocks, like all stock markets, are dominated by a very, very small set of very, very large winners. The majority of stocks in the market lose money. See below. We acknowledge that it is very difficult to accurately select stocks that are the next up-and-comers to lead market performance. As a result, we have preferred (for the most part) to use diversified ETFs that invest in reliable factors ­­­of return to get a step ahead of most investors. The future, however, as we have talked about, may involve a return to picking direct company stocks. It’s intuitive that the more stocks you include in your portfolio, the less chance you have to be wrong. But CLS believes that the best way to add value may be to try to avoid the losers rather than trying to pick the winners. CLS’s Target Strategy Portfolios use several screens for quality to avoid junk stocks that often plague losing portfolios. Read some more great blogs on the above here, here, and here. CLS recently released a special market bulletin on the topic of the yield curve inversion. The notes are below; for a full copy, please reach out to me or the CLS Sales team. What has an inversion meant historically? An inversion of the 3-month/10-year and the 1-year/10-year has typically been common when the U.S. has been in the late stages of the economic cycle. An inversion does not mean an equity market will move lower right away. In fact, the market has typically peaked after an inversion happens, suggesting the potential for further gains. Thus, we cannot use an inversion as a timing tool to enter or exit the stock market. An inversion may mean an end to the long economic cycle in the U.S., but we believe that predicting when the economic cycle ends is also difficult. The typical range is 8 to 24 months. Should you be making changes to your portfolio? 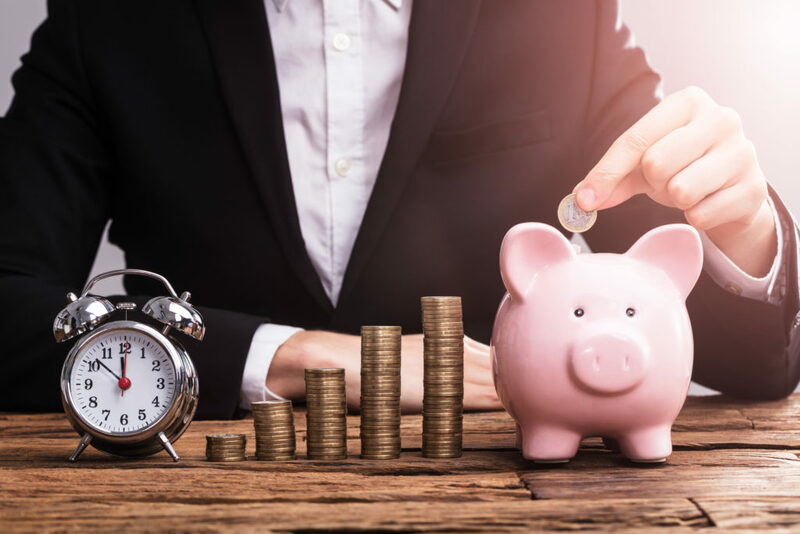 You should already be properly positioned and globally diversified to realize your long-term financial goals; and, if you are, you should stay the course. CLS strongly recommends against trying to time the market. Studies show that attempting to time the market detracts value over the long run. What is CLS watching for now? At CLS, we closely monitor events such as yield curve inversions. CLS maintains portfolios that are properly diversified for the amount of risk investors are comfortable taking on — no more and no less. CLS is currently emphasizing high-quality bonds, globally diversified equities, and alternatives to further diversify against a rise in volatility. The S&P 500 Index is an unmanaged composite of 500-large capitalization companies. This index is widely used by professional investors as a performance benchmark for large-cap stocks. An index is an unmanaged group of stocks considered to be representative of different segments of the stock market in general. You cannot invest directly in an index.